Ok, The Happening was a piece of crap. There’s no denying this fact, so get on with your lives and forget Marky Mark ever attempted to be a science teacher. Many think that wasn’t M. Night Shyamalan’s first misstep, though, people have fallen away from his work since The Village—a movie I am proud to call one of my all-time favorite cinematic artworks of style, tone, and emotion. Perhaps audiences got spoiled and pigeonholed the man into a spot he could never live up to, one where we’d have our minds blown by everything he touched. So when he made a love story—yes the advertising was dead wrong—the fanbase disbanded. As a result, I truly believe people are bashing his newest work unjustly, not taking the time to understand what the film is about, or that it’s even based on an American anime, Nickelodeon program “Avatar”. This is a PG, kid-friendly, adventure flick with a deep mythology and loyal following. You can’t go in expecting anything more than that; if you do it’s your own fault. I’ve never personally seen the original cartoon, but I’ll say right now, I had fun with The Last Airbender. Shyamalan has always had an idiosyncratic way of writing dialogue. He appears to want to be the next David Mamet and time his words to a precise meter, but in fact it only comes out stilted, disjointed, and very cyclical, oftentimes using the same name twice in one sentence rather than plugging in a pronoun for variety. It works in The Village due to its old-fashioned environment and speech; it doesn’t fare so well in his other films, including this one, despite inhabiting a wholly unique world. Maybe the prevalence of such repetition is so young children can understand it, maybe it mirrors the show, I don’t know for sure. However, besides this minor gripe, and the fact the performances are very sub-par and over-the-top—could be a nod to the equally exaggerated anime overdubbing commonplace in the genre—the movie is very well made. The story itself never talks down, allowing the legend of Air, Water, Earth, and Fire to be uncovered as the characters become familiar with the newly discovered return of the Avatar. And the choreography is stunning. Graceful in its ritualism, flowing in its movements—sometimes even devoid of sharp cuts, showing the technique in full—the action sequences are memorable. The world itself consists of four nations, one for each element. There are special members of each with the power to ‘bend’ or move the element of their people as an extension of themselves. Only one person, the Avatar, can handle all four, making him the peacekeeper and leader of the rest. Perpetually reincarnated, the God-like being is also the only one able to speak with the Spirit world, a gift that brings with it a price. To hold such power and responsibility means to forego a normal life. All the world’s creations become your children, all its troubles your duty to rectify. So, when the new Avatar finds he is unable to take on such weight, at such a young age, he runs away to be entrapped in ice for over a hundred years, the world disintegrating into chaos in the meanwhile. The Fire Nation decides to hold court over the rest, using its element to create new technologies and machines capable of inflicting destruction in order to sway control in its favor. Knowing the legends, how the new Avatar would take the form of an Airbender, the Firebenders annihilate each Air colony and imprison all other benders of Water and Earth, positioning themselves as the world’s ultimate force. When siblings Katara (Nicola Peltz) and Sokka (Jackson Rathbone) discover young Aang (Noah Ringer) trapped in ice, they never anticipate what is to come. Their destinies have been set towards protecting the boy, helping him achieve his full potential and take his place as Avatar of the four nations. It is their journey to the Northern Water Region that this first installment in a planned trilogy concerns, finding a way to hone his skills with water and stand a chance against the immense army of Firebenders. It’s a perilous quest with two factions chasing, one led by Commander Zhao (Aasif Mandvi), right-hand of Fire Lord Ozai (Cliff Curtis), and the other by the Lord’s son Prince Zuko (Dev Patel), disgraced and banished to never show his face in the Fire Kingdom unless in possession of the Avatar. Zuko is stewarded by his uncle Iroh (Shaun Toub), a man with hidden secrets. The Prince is exiled for being soft, questioning a General and refusing to fight his father in a dual of strength. There is compassion in the boy, as well as a burning desire to prove he’s worthy, two conflicting forces battling it out to see whether he turns to the side of good, with Aang, or evil, with his father. For being such an expository film, explaining a lot of mythology in a short period of time—admittedly seeming rushed—The Last Airbender does a great job in still retaining its own identity. Besides acquainting the audience with the environment in play, Shyamalan does his best to introduce each character and his/her motivations, watching as they fight and befriend, letting emotions overtake them and also patiently relent. Aang must live with the unintentional blood on his hands from his fearful flight; Katara and Sokka must grow into the warriors they’ve been born to grow into; and Zuko must find a voice of his own, discerning between his father and uncle for which direction to move towards. And through it all, battles rage on with stylized tornadoes, tsunamis, earthquakes, and comets, all rendered gorgeously to coexist with their live action counterparts. Everyone handles their fight maneuvers deftly; making you believe each inhabitant of the four nations is well versed in martial arts and bred for the war that’s been waging ever since Aang’s self-imprisonment. Ringer is smooth in his motions, while a bit raw on the acting side of things; Rathbone is almost as stilted as his wide-eyed Jaspar in the Twilight series; and Patel is so earnest you feel as though his head will explode. There are some shining moments too, though, including Peltz’s desire to protect and serve and Toub’s secretive elder statesman—the actor can turn any role into gold. And, as a result, the good far outweighs the bad. Just remember the film was shot in only two dimensions, so the 3D conversion is probably shoddy, (I have heard this to be true). I myself didn’t cave to spend the extra cash for a poor attempt at Hollywood thievery, but won’t stop you from making the mistake yourself. After all, the more cash this one makes only helps the possibility of seeing the final two installments in the future. 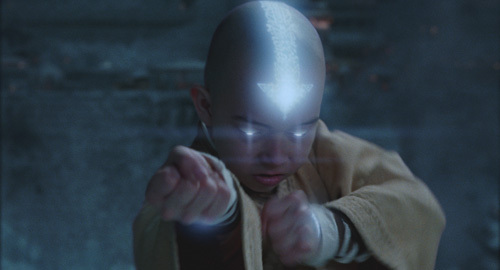 Noah Ringer is the heroic Aang in the Paramount Pictures/Nickelodeon Movies adventure, “The Last Airbender.” Photo credit: Industrial Light & Magic Copyright (c) 2010 Paramount Pictures Corporation. All Rights Reserved. 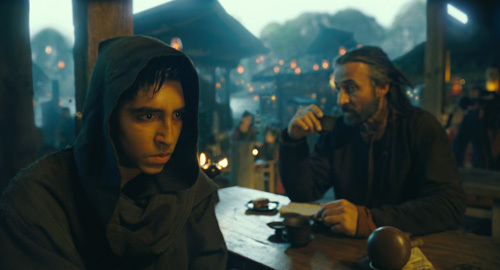 Left to right: Dev Patel plays Prince Zuko and Shaun Toub plays Uncle Iroh in the Paramount Pictures/Nickelodeon Movies adventure, “The Last Airbender.” Photo credit: Industrial Light & Magic Copyright (c) 2010 Paramount Pictures Corporation.